There’s something so perfect about a treat that’s super sweet, but also super tiny. So of course we’re obsessed with waffle pops. First of all, the right amount of sweet is essential. But we’re not always looking for sugar overload. Consequently, we’re big fans of cake pops, mini cupcakes, you name it. Additionally, we always give our vote to anything that’s sweet, tiny, and portable. As a result, we’re super excited about this new sweet trend. That’s right, some genius has put tiny, sweet waffles on a stick. California-based company Sweet Combforts created this beautiful sorcery. 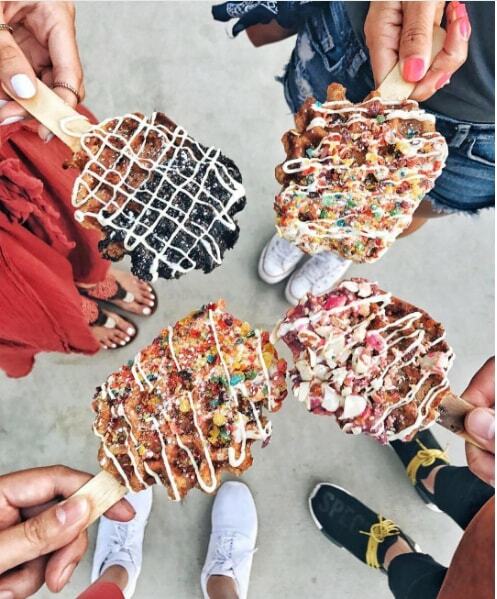 Furthermore, they debuted their waffle pops at Coachella this week. Needless to say, they’ve been a huge hit. Honestly, how could they not be? Because they look like the perfect vehicle for chocolate, Oreos, or pretty much any sweet topping you can think of. Just check out these awesome Instagram posts, and try not to get jealous. Like fruity pebble waffle pops. The s’mores waffle pop looks like the best thing ever, TBH. We’re very jealous of these four anonymous customers. We’re obsessed with this perfect pink waffle pop. According to the bio on the Sweet Combforts Instagram, Coachella was their debut. They unfortunately do not have a physical location yet. However, they’re coming to the Trade Food Hall in Irvine, California in May. So keep an eye out if you want to snag one of these pretty pops! If you can’t make it to California, or can’t wait for these beautiful sweet waffles, never fear. The Sweet Combforts waffle pop is actually a new take on an old classic, the liege waffle. Therefore, they can be found all over the country. As a result, there’s no need to wait if you need a sugary waffle right away!